Do you feel that your workplace lacks enthusiasm and team spirit? Now you can forget your worries because here are some effective ways to keep the office environment positive and to encourage team spirit. The work environment surely impacts the goal of the company. If the working environment is healthy and happy you will surely love your work and your productivity will be at peak. But if you have an environment that has unfriendly workers you’ll never feel motivated. To help you overcome such a situation, we have found out some effective ways to improve the office environment. Communicate and ask your team members about their weekend, and check in to see if anyone needs assistance with ongoing projects. All the team members want to feel appreciated and comfortable, so give them a little nudge and motivate and appreciate their work. 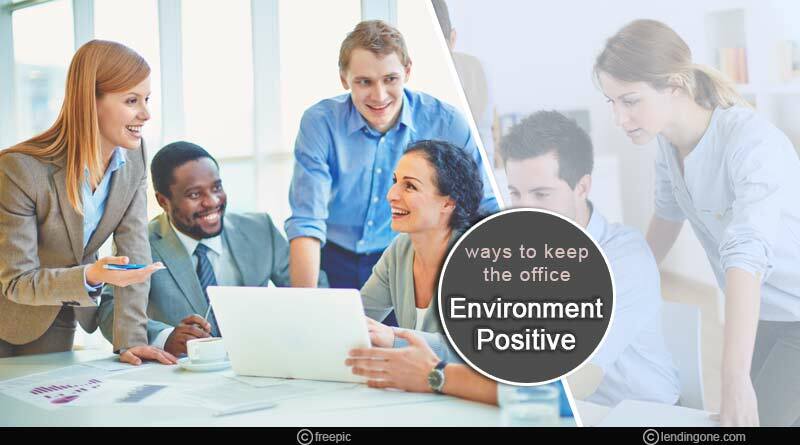 Creating a positive atmosphere for employees is important for achieving targets at work. Be realistic about the amount of work that an employee can handle. Excessive work is one of the top reasons that people leave jobs. Research shows that productivity goes down when someone works for more than usual timings. If you give an employee more work, show that you value them by also giving them a raise or promotion. You could hire more people if everyone has excessive workloads. This will cost you more, but you will definitely see greater retention and productivity. In order to reach your goals, team members should fully understand the company’s mission and purpose. So, it’s your job to make sure that they know what that looks like. Give some authorities to team members and let them take minor decisions. Employees spend a large portion of their day at the workstation, so let them decorate their area in ways that are personal and appealing to them. This may include choosing a standing or adjustable desk, an office chair or an ergonomic keyboard and mouse. Employees should feel free to adorn their office desk with personal photos, plants, and desk lamps. When we customize our space, we feel more personal and will extend to everything we do at work. Implement some new and fun initiatives for the purpose of increasing happiness and a sense of well-being. For example, once a month, you might go for a group lunch or evening snacks. You could also go for picnics or play friendly sports matches. Such activities also help inculcate team spirit among the team members. Organizing workshops and training sessions can help people interact and grow. A happy workplace attracts happy people and in turn, promotes a culture of productivity and accountability. A person that brings laughter to the workplace will improve productivity and keep the office environment light. Positive people encourage a positive work environment. It’s not an easy job to maintain positivity but if you keep your employees empowered and engaged you will surely achieve what you want. Getting to know your team is one of the best things you could do to create a happy culture and a happy workplace. Make sure you make time for your employees share your experiences, thoughts. It is alright to have personalized conversations and get to know people beyond their work.